Tomorrow morning we are beginning a six-day journey to Skagway, Alaska, with Monroe, Washington, a bedroom community north of Seattle as our starting point. Our drive will cover about 1700 miles and take us through several different geograpical areas of the Northwest including farm country, river valleys, desert country, mountain terrain and alpine meadows. We will cross the Rockies twice and hopefully avoid snowfall. 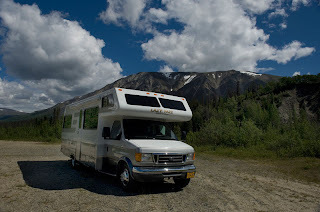 May 5th is a just a little too soon to head up to Alaska from the Seattle area, but we need to get back home and mainly get the RV up there and out of storage. We expect cool, occasionally damp weather, especially at night. My wife has been undergoing chemotherapy for the past four years and is currently in the middle of her eighth round. The regular schedule of chemo "infusions" has prevented us from taking the trips we would like to take, but we know that if the RV is closer to home, we will be more likely to take short trips as we can. We'll try to update you daily on road conditions, accomodations, gas prices, food prices, the Canadian exchange rate and any other information that might help you cover the same ground, whether you're heading north or south. We will also add photos as we go, and hopefully show you many pictures of wildlife that is abundant along our route. For starters, here is a shot of our home for the next six days.